Chromium is a trace element present in the body in very small quantities – about 6 mg. Chromium Picolinate – it is its special compound chelate – a combination of chromium ions with picolinic acid. This substance has been designed for maximum bioavailability, safety of use and high efficiency. The main action of chromium is stabilizing and strengthening the insulinn economy of the body. This alleviates the spikes in blood sugar level. It inhibits an appetite, particularly for products containing sugar (sweets). This can prevent diabetes! 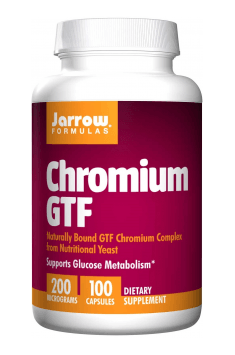 Chromium Picolinate is part of the glucose tolerance factor (GTF - Glucose Tolerance Factor). Chromium also influences on the level of cholesterol in blood, lowering the level of LDL ("bad cholesterol") and increasing HDL ("good cholesterol"), and also lowers triglycerides. It acts anti-atherosclerosis and preferably for cardiovascular health. Athletes who do strenght workouts can not find delicate anabolic properties, associated with the use of chromium. Chromium increases the storage of glucose in muscles, supporting glycogen synthesis – this means that more energy 'stays' in the muscles. Similarly acts (together with insulin) amino acids, which penetrate into cells. This effect also applies to molecules of creatine for example (chromium may be a "transport" for it). Chromium GTF 200mcg 100 caps. 1 capsule 1-2 times per day during a meal. Chrome has the ability to increase cellular sensitivity to insulin. It helps control glycemic indexes during the high-carbohydrate meals. Dietary supplement combines two clinically validated plant extracts to help ease inflammation. Dietary supplement that helps maintain intestinal flora, improves digestive comfort from the 1st week. A dietary supplement that supports the formation and function of healthy joint tissue.